Unlike angiosperms, gymnosperms use two different enzymes for the reduction of protochlorophyllide to chlorophyllide: the light-dependent protochlorophyllide oxidoreductase (LPOR) and the dark-operative protochlorophyllide oxidoreductase (DPOR). 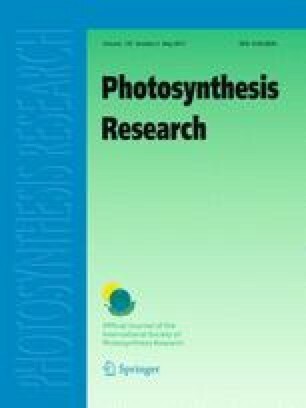 In this study, we examined the specific role of both enzymes for chlorophyll synthesis in response to different light/dark and temperature conditions at different developmental stages (cotyledons and needles) of Norway spruce (Picea abies Karst.). The accumulation of chlorophyll and chlorophyll-binding proteins strongly decreased during dark growth in secondary needles at room temperature as well as in cotyledons at low temperature (7 °C) indicating suppression of DPOR activity. The levels of the three DPOR subunits ChlL, ChlN, and ChlB and the transcripts of their encoding genes were diminished in dark-grown secondary needles. The low temperature had minor effects on the transcription and translation of these genes in cotyledons, which is suggestive for post-translational control in chlorophyll biosynthesis. Taking into account the higher solubility of oxygen at low temperature and oxygen sensitivity of DPOR, we mimicked low-temperature condition by the exposure of seedlings to higher oxygen content (33%). The treatment resulted in an etiolated phenotype of dark-grown seedlings, confirming an oxygen-dependent control of DPOR activity in spruce cotyledons. Moreover, light-dependent suppression of mRNA and protein level of DPOR subunits indicates that more efficiently operating LPOR takes over the DPOR function under light conditions, especially in secondary needles. The original version of this article has been revised: The author names have been corrected. The online version of this article (doi: 10.1007/s11120-017-0354-2) contains supplementary material, which is available to authorized users. An erratum to this article is available at http://dx.doi.org/10.1007/s11120-017-0368-9. This work was supported by the National Program of Sustainability I [Grant LO1204] of the Ministry of Education Youth and Sports of the Czech Republic. We thank prof. Yuichi Fujita (Nagoya, Japan) for kindly providing antibodies against subunits of DPOR.